Local. Inclusive. Rahash. These three words sum up why I walked away with a truly memorable experience in Qatar, a place that never held any food excitement for me in the past. 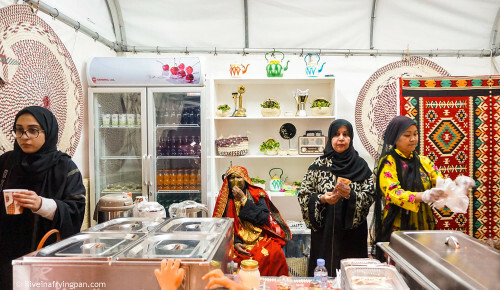 But with the sparkly Shaima Al Tamimi involved behind-the-scenes for the 6th edition of the Qatar International Food Festival, it took me all of five seconds to realize that a trip to Doha under her expert food guidance would be right up my alley. This post is dedicated to the three most impressionable Local or ‘made-in-Qatar’ experiences I savoured during the festival. I’ve already penned a post focused on Rahash. As for the festival being inclusive, suffice it to say that I appreciated being surrounded by a mix of nationalities and people from all backgrounds – it didn’t feel elitist which things often do feel in the Gulf region. What was key is that the festival didn’t charge a lofty entrance fee, which enabled more working class families to attend. In my very narrow selection of three local places in this post, I will admit that I've skipped the high end and mid-tier 'imported' experiences that the organizers had generously planned for us. 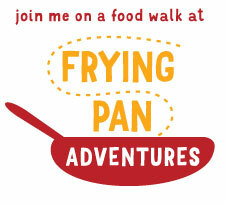 Let's be honest, I live in an old school hand-me-down frying pan. Not in le schmanzy creuset. This was hands down the most authentic, home-style and satisfying experience of the trip. 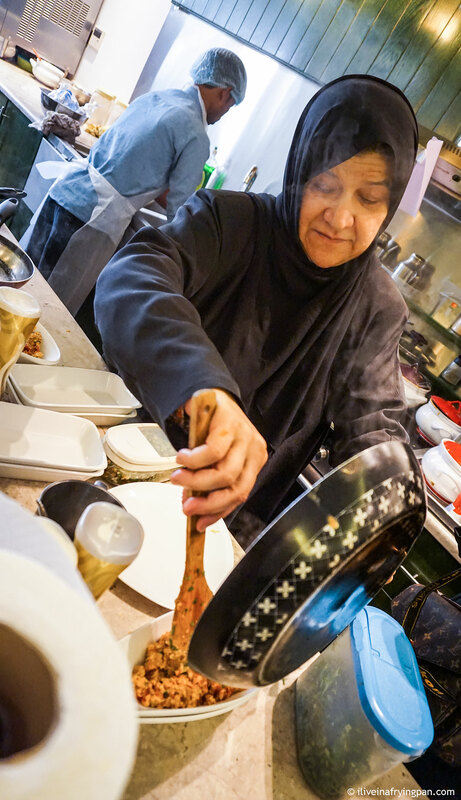 Chef Shamsa is a local Qatari lady whose vibrant, fire-cracker personality holds true to her name: sun. This is the first time in my near lifetime of living in the GCC region that I’ve witnessed a local lady running a restaurant kitchen and infusing her food with the inimitable taste of a mother’s hand. Her breakfast defined simplicity at its soulful best. Things just kept emerging from her kitchen. Bowls of creamy scramble, my favourite being the one seasoned with fragrant dill. Crackery regag bread smeared with spiced eggs and a swirl of Kraft cheese. Butter-laden sweet pudding (aseeda). Glasses brimming with hot, uplifting chai karak. 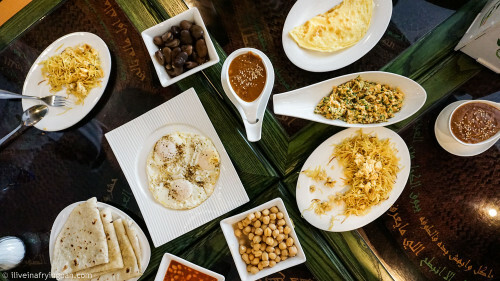 The perks of having your morning fix at Shay Alshomous (make sure to get there before 9AM – I’ve heard they run out) is that you can walk it off at Souq Waqif right after. The name of this souq translates to ‘Standing Market,’ a reference to the century-old tradition of hawkers standing by the shore of the Arabian Gulf to sell their wares. 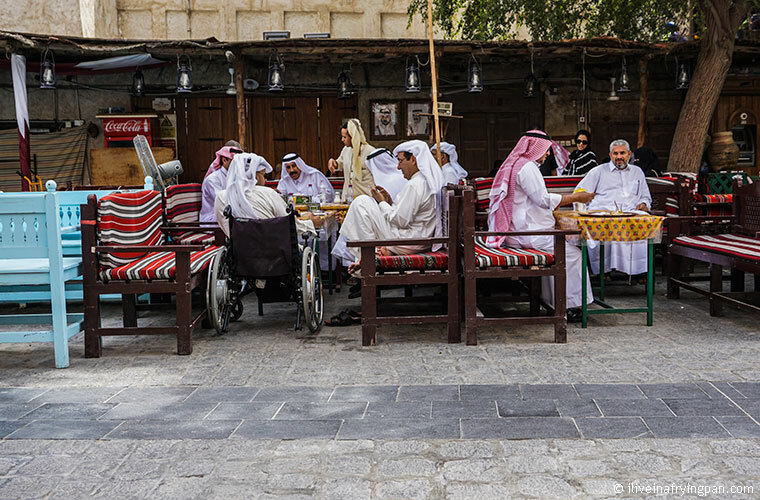 The Souq has been tastefully renovated over the past decade and is one of those rare market experiences in the region where the sellers aren’t obnoxious, pushy or gimmicky. (Surely our souks in Dubai can learn something from here!) 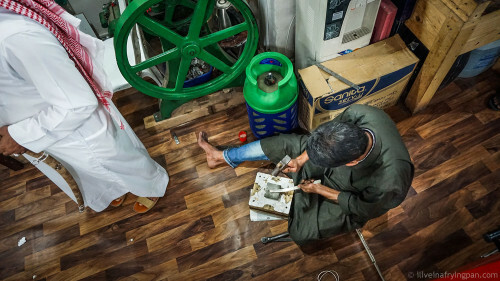 You see real skills at play in the market, from falcon-rearing at the Bird Souq to sword-making, glass-blowing, halwa-making and agal-shaping (aal is the black headband worn over the white ghuthra worn on the head by most locals in the GCC, except Oman). Every alley has a discovery and a few hours are simply not enough to unravel it all. But back to Chef Shamsa’s breakfast, I continue to crave her food on many a hungry morning – and even a not so hungry morning - back in Dubai. 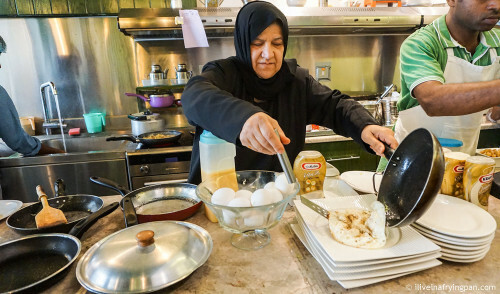 If there is one and only one breakfast to have in Qatar, you’ve got to have it at the flavour-laden hands of this lady. Over a month after the festival, the taste of the lamb machboos from Sufrat Magadna still haunts me. I distinctly remember holding the spoonful of caramelized threads of tender lamb against the festival lights, lusting after the rice pockmarked with lentils, and sighing after relieving the spoon of its burden. I should have eaten more. Even if I didn’t have a millimetre of tummy space left, I should have crammed it in. I failed myself, I failed you all. I ate like a cow when I should have really eaten like two cows. We also had a wholesome lentil porridge or madhrooba which inspired me to cook up a version of the dish from Sarah Al-Hamad’s book, Cardamom and Lime. 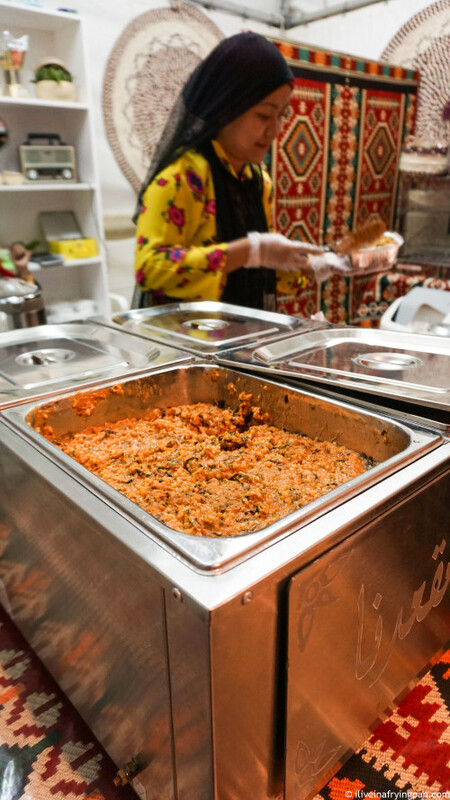 A well-composed madhrooba can be soulful, healing, comforting – the thought of it can make you so hungry that you experience writer’s block because every neuron in your brain is sniffing for that invisible but prominent memory of home-cooked spiced lentil aroma. Sufrat Magadna does not seem to have a presence on Instagram, so I’m not quite sure how one is supposed to order from them during the rest of the year when the festival is not on. 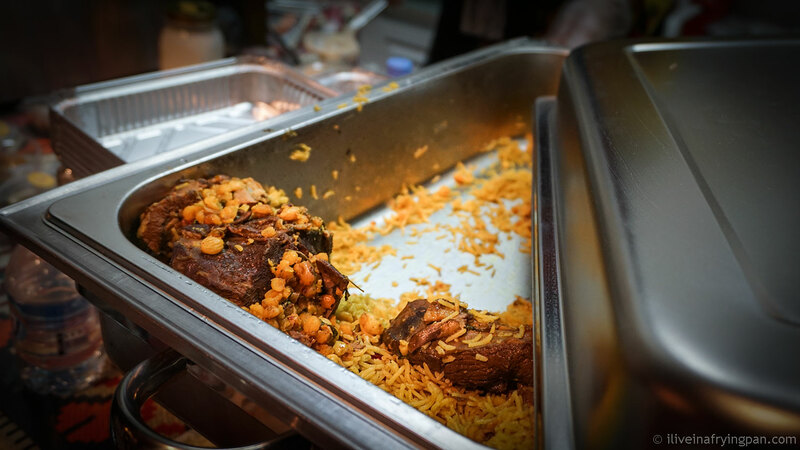 But worry you not, I hear that there are stalls in Souq Waqif where you might find this and many more traditional Qatari dishes. And for the rest of us who’re not within walking distance of Souq Waqif in Qatar, well, we’ll just pretend that the bowl of cereal we could feast on five seconds from now would be infinitely better than a pot of homemade madhrooba anyway. The smell of bread is mesmerizing across almost every culture. Seriously, find me a person who’d say, yuck, I hate the smell of fresh bread! If there’s any lesson to be learnt from my excessive indulgence during the Qatar International Food Festival, it’s that the local fare is the most satisfying and memorable. Hunt it out. 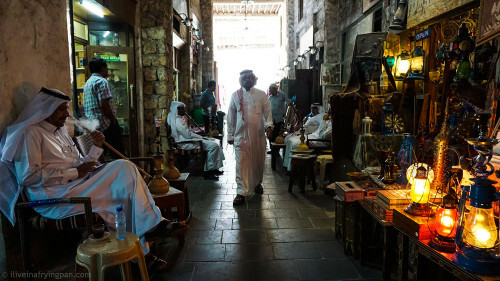 The Souq Waqif might be a good place to start looking, and I can see myself easily spending two days there just eating my way through the place. Amazzzing. I wish we had more time at the souq so we could do a proper trail! 2 hours was just a teaser by the way! I have been told that Qatari local food is amazing. And now I’m salivating at the thought of creamy scrambles, regag and spiced eggs ufff by chef Shamsa. Got to find a way to make it to Qatar!